UPDATE: Couple of related editorials in The Irish Times within days of this post. Here, Vincent Browne poses “13 questions that have to be answered” about the banking crisis. And here, Ray Kinsella says that financial ethics are more important than regulation. Could the Irish banking and economic crisis been prevented? Is a similar financial fiasco likely in the future? The answers appear to be maybe and probably, according to former International Monetary Fund economist and Irish Fiscal Advisory Council member Donal Donovan. He fielded questions from Irish Times Washington correspondent Simon Carswell and audience members during a 5 May forum sponsored by Irish Network-DC. Despite such government probes, courtroom dramas and media headlines of the past few years, “more national debate” is needed about the systemic issues at the heart of Ireland’s financial woes, Donovan said. Those problems can not be simply set at the feet of a few greedy bankers and civil servants who looked the other way as their elected bosses focused on the next election, he said. The Irish people also enjoyed riding the Celtic Tiger, and even financial experts from the IMF missed signs of the pending disaster. 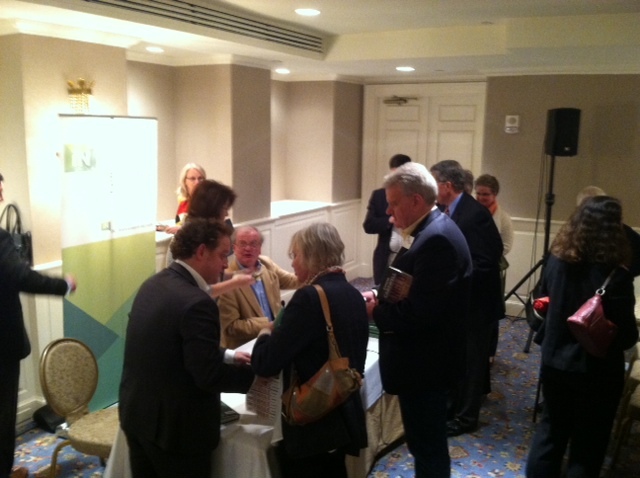 Simon Carswell, standing left talking with woman, and Donal Donovan, seated in tan jacket, sign copies of their books. Amazingly, there was no record made of the government’s 2008 guarantee to back the failing banks, Donovan said. Most of Ireland’s crushing debt was related to its inflated national budget, not the bank’s bad loans. But all the problems were driven by the property bust. 3 percent annual growth appears to be the best Ireland can hope for in the near future, gradually lowering unemployment and emigration. “Four to five percent is hard to see,” Donovan said, adding the country still has to cope with high cost of living. One member of the audience suggested the influence of Roman Catholicism is at the heart of the financial crisis in Ireland and other South American and Southern European nations. The religion’s “lack of contrarianism” and group think “could have played a role,” Donovan agreed. Another audience member said the roots of the problem date to Alan Greenspan’s decision to lower interest rates in the wake of the Sept. 11, 2001, terrorist attack. This entry was posted in Business & Environment, History and tagged Donal Donovan, financial crisis, Simon Carswell on May 6, 2014 by admin.